We are enjoying a restful evening at home. 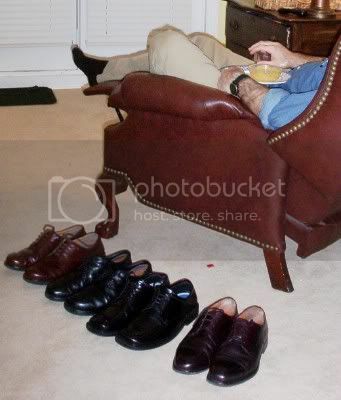 My husband polished his dress shoes while watching the Sugar Bowl. I didn't find the answer online, but I did find this page of frugal healthy eating tips , courtesy of Counting The Cost. I doubt the bowl of chili cheese dip on my husband's lap would qualify as healthy eating, though I did make it using a can of Amy's Organic Chili from the discount grocery! Meredith, you are a marvel! I should have left a comment before now as I have been reading your blog for several months but I just want to say how much I enjoy it. It is a real inspiration to me in so many ways - not least in how to live frugally while still expressing creativity and joy (and you find such great sites to link to!). Visiting your blog is like visiting a friend's house! Thank you for taking the time to write and share with us. Meredith, I would have loved to spent my time yesterday relaxing at home however due to the bad storms we had yesterday it was not so easy to relax at home. However Today is a great day outside with the Sun being out. Today is a day to just relax and thank God for another year of his blessing and provision of last year and also of this year. I think you'll have to figure out the yogurt on your own, because it all depends on how much *you* pay for milk and for yogurt at the store. I've found that grocery prices really vary around the country! If you haven't made yogurt, it takes about a quart of milk to make a quart of yogurt. (I get more yogurt because I put in 1/2c of dry milk. If you do that, you'll have to factor in the price of the organic dry milk, too.) For non-organic, plain yogurt costs about $3.59/quart. I never see it on sale. Since regular milk is $3.29/gallon, it's a LOT cheaper for us to make our own yogurt, even factoring in the dry milk. This also assumes you own a yogurt maker of whatever sort. I used my dehydrator, but just bought a yogurt maker. It cost $20 thru eBay. So you may have to factor that cost in if you don't own one. However, you can also make due w/o a machine if you have a, electric heating pad. I didn't. Let's say you make yogurt once a week. In a year, it will cost an additional 50cents (figuring loosely) per quart of yogurt. It's still cheaper for me to make my own yogurt! And yes, we make it at least once a week. Hopefully more now that I have the machine. I have one of the old Salton yogurt makers. I used to make yogurt a lot using powdered milk. Now I'm trying to switch to organic, I need a bit more price-checking to figure the price. A half-gallon of organic milk is $3.09 at Sam's Club. I'm guessing it will still be a savings to make our own again, plus I can control the sweetener. Thanks again for sharing your calculations! hI, i'M JUST PASSING THROUGH, BUT WNTED TO GIVE YOU ALL A TIP ABOUT MAKING YOGURT. yOU DON'T NEED A YOGURT MAKER. JUST HEAT THE MILK IN A POT, PREFERABLY STAINLESS STEEL. aDD THE YOUGURT, MIX IT UP. tHEN PUT IT ON THE COUNTER OUT OF THE WAY AND WRAP IT WITH A BLANKET AND-VOILA! 8 HOURS LATER, YOU HAVE GREAT YOGURT.